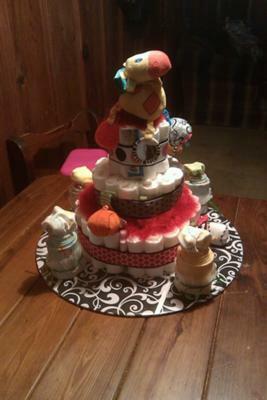 We love posting our readers' diaper cakes! And this diaper cake is such a wonderful mixture of color, texture, patterns, and embellishments! It is so adorable and a perfect addition to a baby shower! 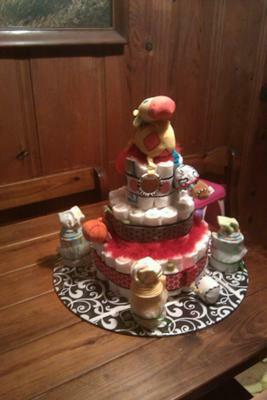 Shilo shared her first diaper cake with us to pay it forward with her creativity and ideas. You should also take a look at her onesie and receiving blanket cupcakes...just look closely at her pictures above. So cute! Shilo, your ideas are so delightful! Thanks for sharing with us! If you have some diaper cake ideas to share in our diaper cake gallery, just submit them right here! Well designed, Well written, Well done! Brilliant information on this website, I would highly recommend people to read information here. This is sooo cute!!!!! Great job!